It’s hard to believe, but it’s true – two decades have passed since the formation of our much-loved teenage favorite, Taking Back Sunday!! In honour of their twenty-year anniversary, they’re releasing a new compilation album and taking it on tour around the US – coming to the Hollywood Palladium on Friday 12th April 2019! We’re willing to bet it’s going to be something special even by Taking Back Sunday standards – whatever you do, don’t miss it!! Grab your tickets to see Taking Back Sunday NOW before they disappear!! Emerging in 1999, Taking Back Sunday helped to spearhead the start of the emo alternative subculture and music scene that so many teenagers attached to during the 2000s. Their first album, “Tell All Your Friends,” has a special place in the hearts of many, with its melancholic, romantic angsty lyrical content. Today, despite not being the band’s breakout album, “Tell All Your Friends,” is regarded as one of the defining albums of the sound of the early 2000s, with Alternative Press writing; it’s Tell All Your Friends' intangible and emotionally charged energy, the uncertainty, the earnestness and the rough edges that make it so special,” while Rock Sound called it “the Hybrid Theory of emo.” The focus of the tour, unsurprisingly will be the band’s very first album “Tell All Your Friends,” along with special fan favorites from later releases. 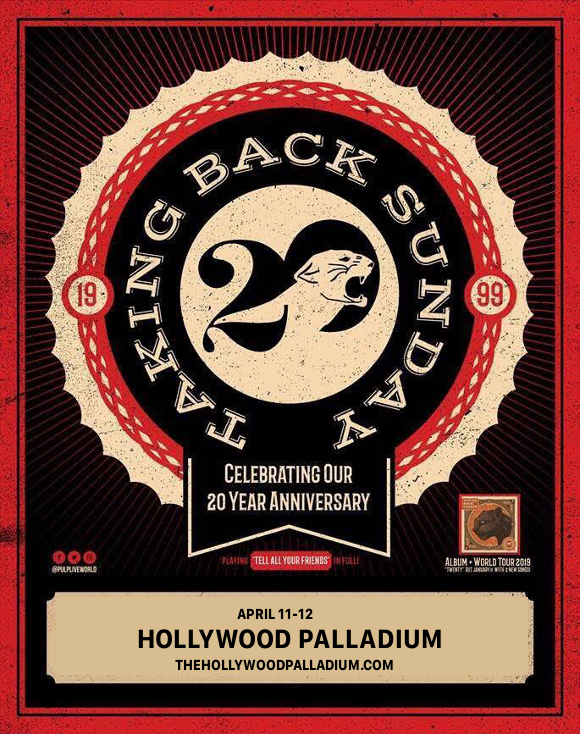 Don’t miss out on what promises to be a truly epic show – grab your tickets to see Taking Back Sunday at the Hollywood Palladium TODAY! !